Working as a photographer would have to be one of the most challenging artistic jobs around. Not only are light and composition extremely important, but the subject matter has to appeal to the photographer and the audience, and there can be added difficulties in capturing the right focus within the camera’s lens. While human portraiture and nature/ landscape photography are considered difficult enough, animal portraiture takes the challenge one step further. Animals are less likely to obey commands to ‘look this way’ or ‘move to the left’, and are more easily distracted by their surrounds than a person may be. Unlike nature or still-life photography, where the object of the photo is probably not going to be moving, an animal’s energy or curiosity is bound to make them move around quite a bit, making it difficult to focus on a shot. These challenges (and the resulting photos) are the benchmark on what sets apart a good animal photographer from a great one. Alex Cearns, a pet and wildlife photographer (as well as a passionate animal lover) has won more than 50 Australian and international photographic awards for her work, runs Houndstooth Studio, and has now produced her second photographic book featuring some of her most beautiful images. 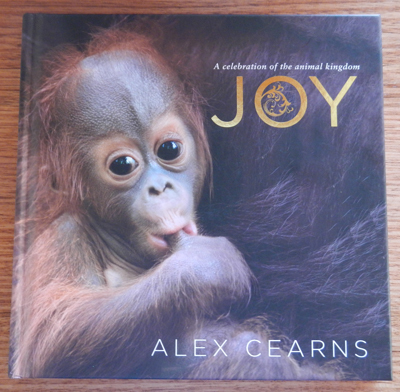 In Joy: A Celebration Of The Animal Kingdom, Cearns features photographs of over 100 animals- from a baby Tasmanian devil to an inquisitive-looking goat, from a footless echidna to an exuberant seal, and everything in between. Focusing on the personalities of each of the animals, and certain characteristics (such as fabulous plumage or striking colour) that draw her audience in, Cearns is able to create beautiful and inspirational photographs of her subjects. Each ‘chapter’ of the book focuses on a different ‘joyful’ aspect of animals, whether it be their playful moods or the innocence or soulfulness they convey. She writes a short introduction for each, before showcasing the images she has taken which she believes best suit that section. A strong believer in animal rights and a firm advocate and supporter in many animal rescue charities, Alex Cearns’ latest photography book is sure to tug at your heartstrings (especially when you see her images of rescued animals). With proceeds from the book going towards the aforementioned animal rescue charities, your purchase of this book will not only make photography and animal lovers happy, but also change for the better the lives of many neglected and endangered animals. I impulse-bought this book for my daughter because she just turned three and we took her to the zoo. She can sit quietly and "read" it to herself if she wants, or make up stories for the pictures.